The QScatterSeries class presents data in scatter charts. The scatter data is displayed as a collection of points on the chart. For each point, two values are specified that determine its position on the horizontal axis and the vertical axis. 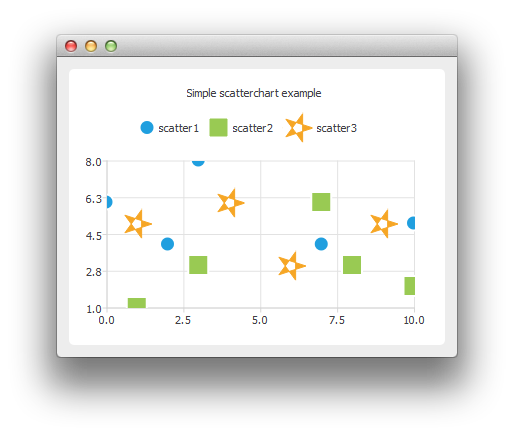 For more information, see ScatterChart Example and Scatter Interactions Example. This enum value describes the shape used when rendering marker items. QScatterSeries::MarkerShapeCircle 0 The marker is a circle. This is the default value. QScatterSeries::MarkerShapeRectangle 1 The marker is a rectangle. This property holds the color used to draw the marker borders. This is a convenience property for modifying the color of the pen. This property holds the brush used to draw the scatter series markers. The brush can be an image that can be created using QPainterPath, for example. This property holds the color used to fill the series markers. This is a convenience property for modifying the color of the brush. This property holds the shape of the marker used to render the points in the series. The default shape is MarkerShapeCircle. This property holds the size of the marker used to render the points in the series. The default size is 15.0. Constructs a series object that is a child of parent. Note: Adding the series to QChart transfers the ownership to the chart. This signal is emitted when the line (pen) color changes to color. Note: Notifier signal for property borderColor. This signal is emitted when the fill (brush) color changes to color. Note: Notifier signal for property color. This signal is emitted when the marker shape changes to shape. Note: Notifier signal for property markerShape. This signal is emitted when the marker size changes to size. Note: Notifier signal for property markerSize. Note: Setter function for property brush.